Week 4 is upon us and we would like to say a sincere THANK YOU to all of our fans and followers! As a token of our appreciation our artist has made a desktop background for you. You can download it fromIndieDB here. Be sure to follow us on Twitter @wolfpackgamesco or #LettersOfMarque to keep up with the latest news and updates. 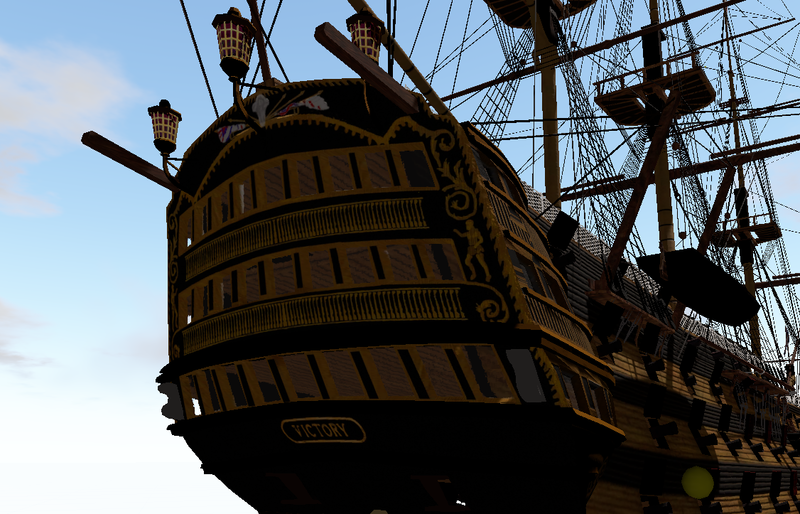 Updated HMS Victory model – Some of the textures are modified and a few of the higher detail objects have been removed. The whole model was gone over and smoothed out and reduced in poly to keep the frame rates high. Windows have been made into glass and PBR textures have been cleaned up and optimized. Next up will be adding in LOD and getting some of the cloth objects working. New keybindings – All new keys are set up. We are using a much more refined input manager that allows us to quickly create mappings for not only keyboard but for controllers as well! Look for an update next week with controller support. 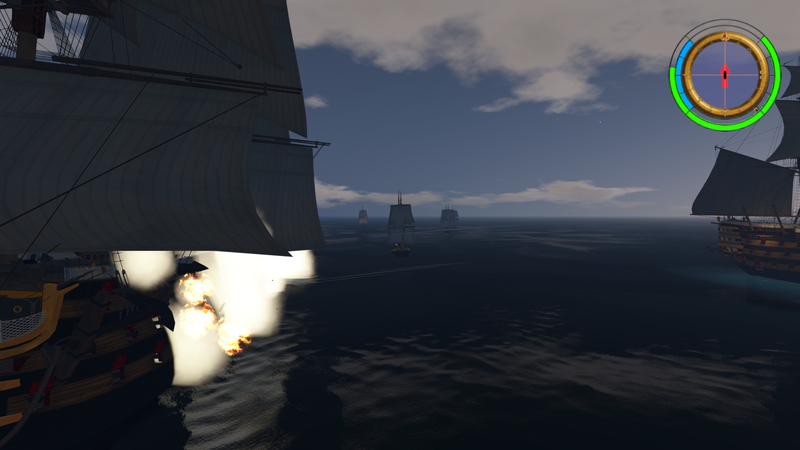 Gun elevation, sail control, and rudder position are all updated to be smoother and more controller friendly. Camera Control – A new camera control was created to make for a smooth camera motion for battle scenes. Currently the ‘deck view’ system is removed until it is finally sorted out for keybinds, but should be back in before next week. Victory AI – The Victory class ship has been added to the battle scene on both the Spanish AND English sides as their flagship. Don’t get between them as they duke it out as they both have 55 guns per side that will tear a player Brig to pieces. AI Updates – The AI is now smarter about gun usage and speed matching. Our test battle scene is an amazing amount of carnage in a short period with the AI able to manage player ship movements and range estimation. 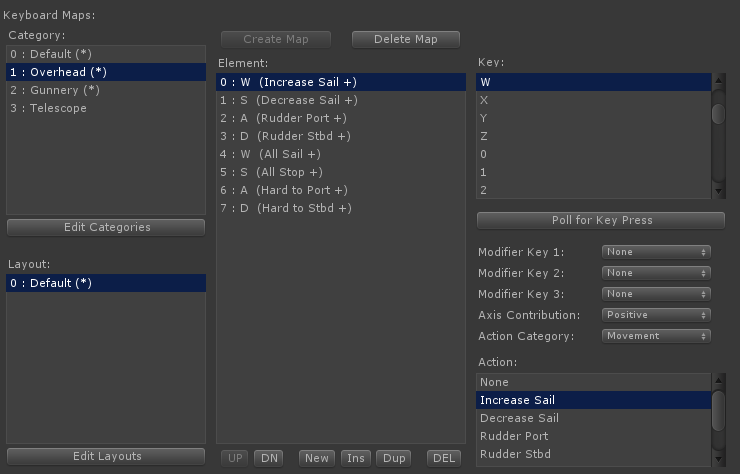 Battle UI – The new UI is now functional for the ship health, rudder position, gun elevation, sail setting, and heading. Players can get a lot of info from one glance at the UI object with more items coming soon. Updated Main Menu splash screens – All new splashes are in place for the main menu. We were able to cut the size and maintain the quality of the splash images while making them more detailed and beautiful. Updated particles – Particle management got a bit smarter with the ability for a particle pooler to handle large and small explosions/splashes/smoke without needing to load another particle system. Through management of the particle components in the pool we were able to effectively halve our memory usage for particle effects without needing to lose any detail. In fact the smoke and fire have gotten even MORE detailed in the past week with better performance. In the next week we hope to have more AI updates, more graphical updates, and quite possibly a new water system in beta testing. We expect to have a playable pre-alpha in less than 2 weeks and are going to be taking applications to become a tester in the next week. Be sure to follow us on Twitter or in IndieDB to be notified of the tester access positions available. Stay up to date, follow us on Twitter @wolfpackgamesco, IndieDB, and here.